My #SPC14 treasure map – mapping out the Expo hall! So I have an early draft of my expo hall treasure map mapped out! Do you have yours? One tip I’ve read repeatedly is to know how to navigate between the various session rooms and the expo hall efficiently. While I’m not aware of any map that’s available for the session rooms yet I’ve taken the time to map out the expo hall and contact some vendors to arrange meetings with them. 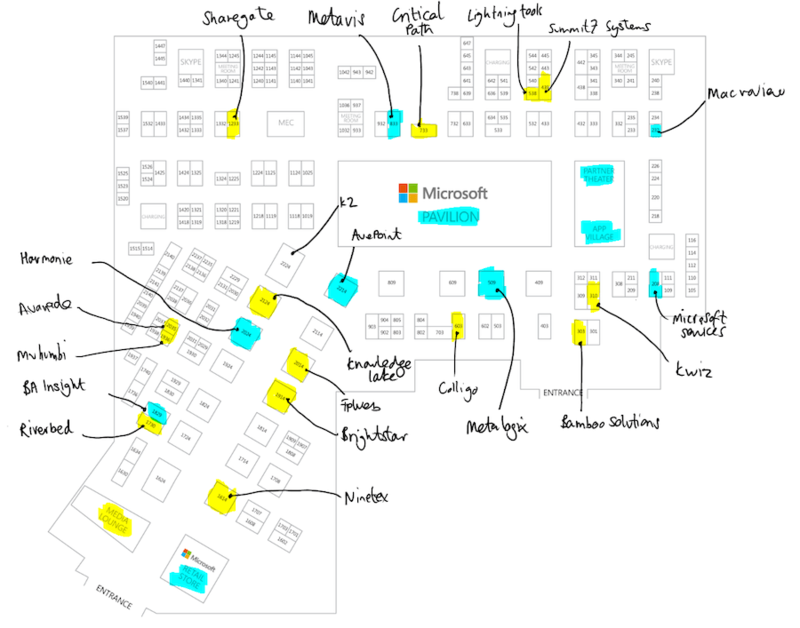 I’ve made use of the expo floor map that’s available through the MySPC website and used OneNote on my Surface Pro to map out particular stands to me a good starting point as to where I will try to visit. I want to say hi to the folks who are partners with ClearPeople and those who I have worked with before as well as other vendors that interest me. Previous Previous post: #SPC14 sessions spreadsheet updated, preparation tips and holiday advice wanted!